What’s the story: Ohio, 1978. High school student Jeffrey Dahmer is approaching graduation. But, impulses that would later cause him to kill begin to control his life. What’s the verdict: Most of us will never know what it was like going to school with a serial killer. Not so Derf Backderf. He attended school in Bath, Ohio in the late 70s, and graduated in the same class as Jeffery Dahmer, who would later go on to murder seventeen men. 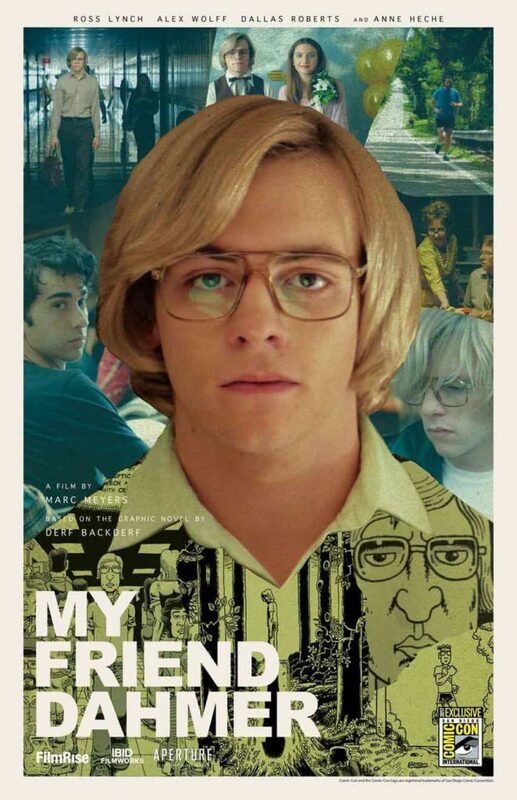 Based on Backderf’s graphic novel of the same name, My Friend Dahmer recounts the killer’s late adolescence. When murderous impulses began to dominate his thoughts, jumbled up with confusion at his burgeoning homosexuality. Plus, the brief time when Backderf and his friends founded the Jeffery Dahmer Fan Club. Here Dahmer was clown king, the other students mistaking his habit of faking seizures and yelping in public as general goofiness, rather than symptoms of rage and a dysfunctional home life. His mentally unstable mother (Heche, on raw nerve form) is driving his browbeaten father (Roberts) to the brink of divorce. Retreating from this, Dahmer finds release in solitary pursuits that feed his urges; dissolving roadkill in acid, stalking a local doctor who jogs past his house, unusual animal cruelty. As with Backderf’s book, My Friend Dahmer portrays the teenager sympathetically without condoning his later actions. Writer/director Meyers keeps Lynch’s Dahmer centre of shot, impossible to miss but overlooked by everyone. Even when acting out in the school library, he is invisible as others are blamed for his disruptiveness. Bath, Ohio of 1978 looks a desperate place. Documentary cinematographer Daniel Katz brings a muted naturalism (albeit dominated by gangrenous green) to the visuals. Houses are isolated by stretches of woodland, indifferent teaches fail to notice problem children under their noses (there’s another, more eccentric, whacko who too deflects attention from Dahmer), high school seniors get off on Dahmer’s “spaz outs”. Backderf (a winning Wolff) and his pals are depicted as typically thoughtless teens, delighted by their bizarre new plaything, something Backderf honestly addressed in his book. They sneak him into key year book photos and delight as he debases himself. Disney Channel alumnus Lynch takes a confident step into the big leagues with a difficult role. Sloped shoulder and sad-eyed, he nails the balance of sympathy and monstrousness. And also Dahmer’s easy charm that later lured victims to their deaths, but in high school got him, Backderf and others into the Vice President’s office on a school trip. The film fails to convey Dahmer’s absolute terror of abandonment, one of the reasons for the murders, or how punishing his alcoholism was in the same way as Backderf’s comic. But, restrained, disturbing and thoughtful, Meyer’s movie is a grimly compelling account of the formative years of one America’s most notorious serial killers.